The Heat is another “odd couple” cop comedy that offers up about what we expect it to, and in doing so, only lets us down by its total lack of any big climactic laughs anywhere. And even though we can get on board with liking our two leading ladies, it takes longer than some will expect. “Sarah Ashburn” (Sandra Bullock) works for the FBI. Her unlikable mastery of tedious facts and trivial job-based knowledge is only a small reflection of the socially limited life she lives, with her having no actual idea of how miserable she really is (until she meets her “better half,” of course). “Shannon Mullins” (Melissa McCarthy) is a cop with a troubled record to go with a bad home-life, but as you might have guessed, she’s a wicked badass cop with a set of “street skills” not to be underestimated. And yes, she’s the outspoken type who says what she feels when she feels it, unlike a prim and proper Ashburn who just isn’t ready for that kind of brutal honesty. When the search for a large narcotics dealer leads Ashburn to work locally with Mullins in Boston, it is then that the two are set to clash before finding out how well their opposite skill-sets make them better as a team than by themselves. We can roll our eyes at the trade-off of personalities that make these two such an unlikely match (and at the fact that one of them is an orphan). We’ve seen it before – and done better (think: “The Other Guys” 2010) – but with a two-hour distraction such as this, we aren’t looking to be overly critical. We are looking for just that—a semi-amusing distraction. 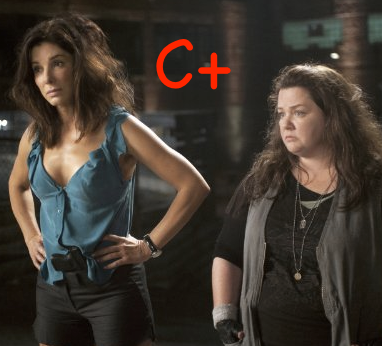 With laughs throughout, but not really any big ones to be found, The Heat offers us more of the usual—an officer who cares too much about rules and “the little things” and one who doesn’t; one who is book-smart and who isn’t so much, but has that “sense” about what is right and isn’t often wrong. It’s more of the same familiar stuff for sure, and it doesn’t all that much care about credibility in its story (or how their characters would ever get away with what they get away with), but as stated, that is to be expected. Rated a very hard R for adult language and material, director Paul “Bridesmaids” Feig didn't give us another big-hitter, but didn't make a flop, either. For McCarthy, this is a slight step down, but her cutting charisma and unstoppable confidence is what gives her the pulling power to keep things up that would otherwise lag. Bullock, with her usual A-list presence, is that much more of a move forward in a movie that will move audiences only a little. It is not the story, but the characters, that occupy what small concern we have for its two (eventually lovable) leads, and some appealing supporting cast members that help, including Marion Wayans as Ashburn’s not-very-secret admirer in the FBI, and Michael Rapaport as Mullins’ troubled brother “Jason.” Not to be forgotten is Michael “MadTV” McDonald as the evil-but-strangely-likable “Julian.” Overall, it’s a likable distraction.